A vicious storm with black clouds and hailstones greeted the crews arriving for the final week of the Early Bird series at HRSC. RO Mike Dellar confidently predicted that weather would skirt to the North of the evenings proceedings, but some were not so sure. This dilemma led to the largest meeting in the Hamble Car Park seen for some years. Some needed to race for a discard, some would prefer a race to the bar and some didn't have a clue what their preference was. Andy Hamlet, XOD Satu, decided there and then that no discard would help his overall position and scurried home. Undaunted, the Race Team proceeded afloat and when on station to the East of Hamble Point declared that there was 15 kts from the West. One by one the boats inched out of the river until, there were 11 yachts thrashing around the start area, in what had become 20 kts. In order to ease their discomfort, it was decided to send them up Southampton Water, where waves are rarely a problem. After Barn would be the first mark and this led to a frantic search for the chart or mobile phone to find out where or what it was. In another show of kindness, the RO combined all the starts so that no one would be hanging around too long. The final master stroke was to finish on the club line not 100 metres from the club bar. Forethought of Gosport, Mike James, led the charge to the line and with a little more reference to the boats name would not have been so clearly OCS. Indeed, one wag on the committee boat declared with 45 second to go " Forethought will be over!" Everybody else behaved themselves and the quest for After Barn began. Nightjar, J92, Joe Banks took an opposite and ultra conservative approach to starting. As they crossed the line some 45 seconds late, they again requested information about the first mark. "Just off the Chapel in the Country Park" came the reply. The Race Team having bounced up and down for long enough retreated to the club line to wait the arrival of the first sail. To everyone's surprise that tardy starter Night Jar was first to come past Hamble Point Marina and head for the line. She would be first by some distance, but it was not enough to save time on M@Enfin? !, Chudziak and Malas, that pesky little Corby 25. In the overall Class 1 series these two were separated by Steph Merry's Midnight Cowboy, who came out but went home before the start and took a discard. Steph explained that with Wendy away there was not enough weight to keep the 1720 upright. 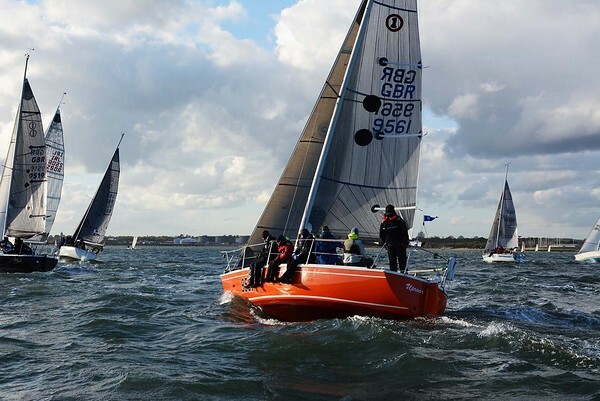 Performance of night came in Class 2 where new member Mathew Girling, who normally sails his Sigma 33 two up, went out single handedin Trixter and won on the water, on handicap and the series. Other Sigma 33 owners have been spotted rushing to local Sailmakers with cheque books in hand. Imptish, Smith, Tullet and Hance secured second overall, whilst Dino Volante, North and Munro, no doubt spurred on by Trixter claimed third. Forethought hung on by the skin of its teeth, and the fact that Starfall, Adrian Hull only came out twice, to take Class 3. Next week is the Bottle Pursuit, and after that Summer starts in earnest with the A Series.